Wittenberg University was founded in 1502 and a printing press was established at the same time to supply students and lecturers with scholarly texts. When Luther arrived in Wittenberg to teach theology in 1508, the printer in residence was Johannes Rhau-Grunenberg. Before 1517, and the advent of Luther’s 95 theses, an average of eight books was published in Wittenberg per year. After 1517, in the next three decades, over 91 books were published per year – three million individual copies – one in three of which were penned by Luther himself. Within 40 years, Wittenberg became ‘Germany’s largest publishing centre’ (Pettegree, 2015). 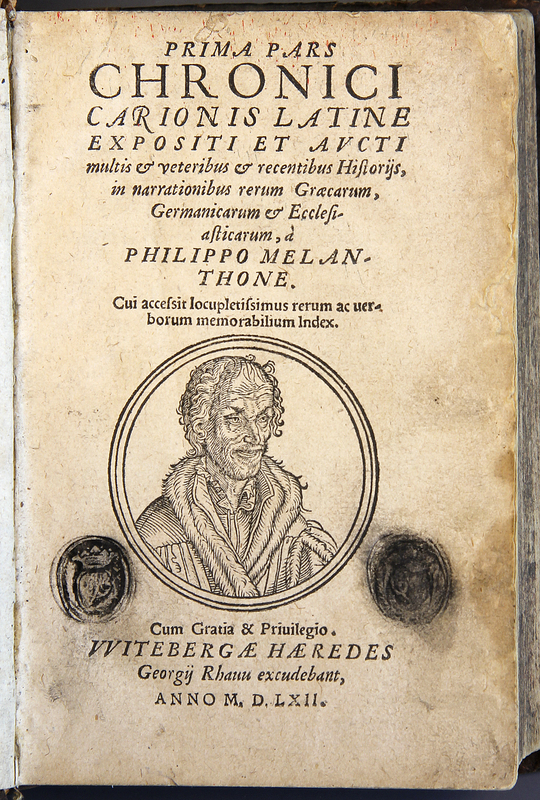 This volume by Philip Melanchthon, Luther’s friend and colleague, was printed by Rhau-Grunenberg’s son, George. Philip Melanchthon, “Prima[-secvnda] pars Chronici Carionis Latine Expositi et Avcti Multis...,” ourheritage.ac.nz | OUR Heritage, accessed April 24, 2019, http://ourheritage.ac.nz/items/show/10330.